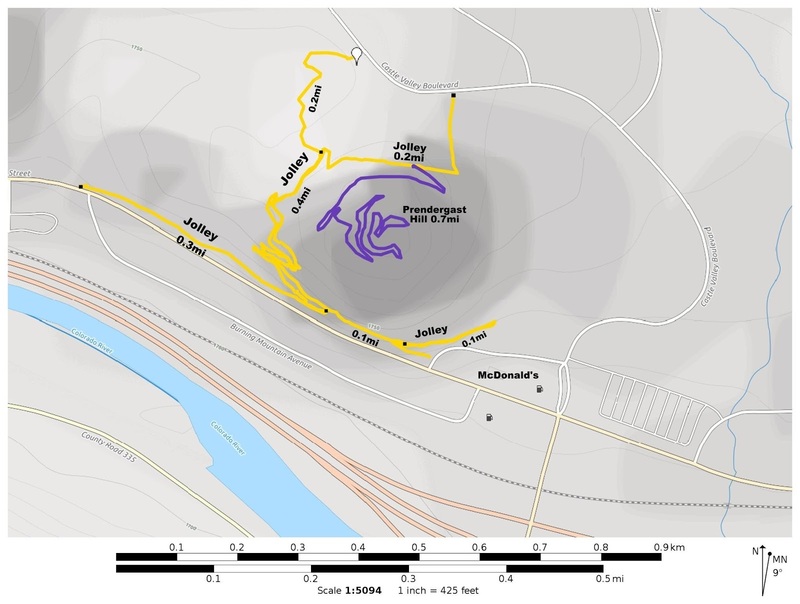 The Prendergast Hill trail is located in New Castle, Colorado. The trail, which is open to both hiking and mountain biking, begins off of the Jolley trail where it climbs a series of 8 or so switchbacks that take it up to the summit where there are views of Castle Valley and the Flat Tops on one side and the Colorado River as it courses its way between the town of New Castle and Burning Mountain on the other side. 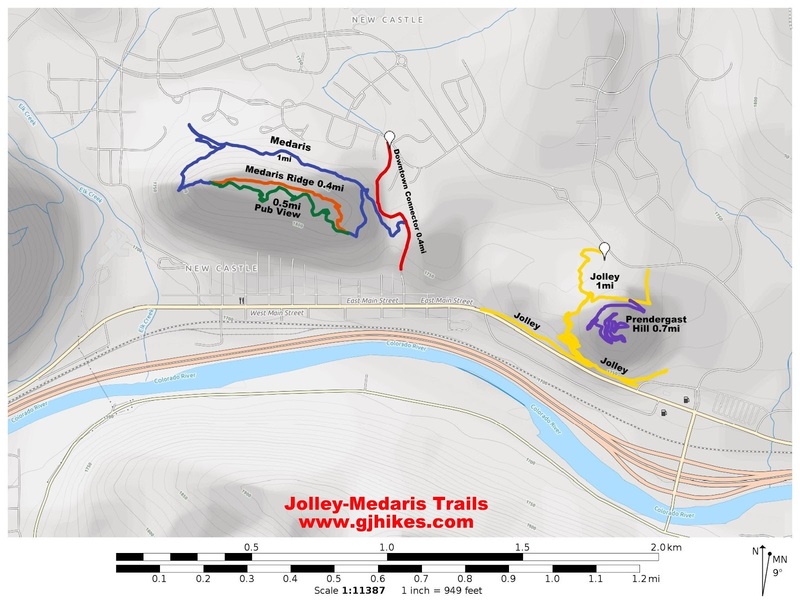 The trail was especially built with both hikers and mountain bikers in mind making it a fun experience for both. 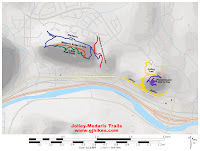 The trail begins off of the Jolley trail on the north side of Prendergast Hill near Castle Valley Blvd. From there the trail starts a gradual climb through the sagebrush that grows along the base of the hill up to the first of many switchbacks. During dry weather the trail has a hard packed adobe base that is mostly smooth and easy going. Trails with an adobe base are best avoided when they are soaked unless you like 10 pound boots or 4 inch wide tires. Juniper trees replace the sagebrush as the trail climbs higher up the hillside. The higher the trail climbs the more impressive the views are of the valley below. Burning Mountain, in a string known as the Grand Hogback Ridge, lies on the south side of the Colorado River where a coal seam fire in the Vulcan Mine has been smoldering away for over 120 years. At times smoke can be seen coming out of the ground with an occasional fire breaking out on the surface. 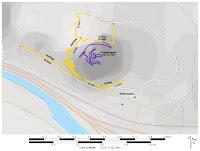 The long sweeping switchbacks, that are stacked on top of each other in places, are one of the trails most memorable features. Viewing the scenery as it peeks through the branches of the juniper trees is another enjoyable aspect of the trail. As the trail reaches the summit it begins a loop that takes it around the crown of the hill. 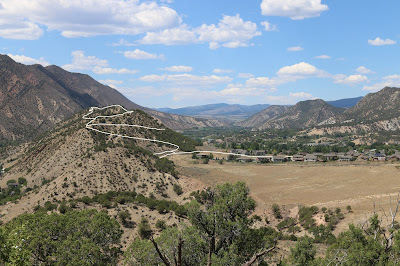 Over the course of the last few hundred years a lot of history has been viewable from Prendergast Hill including bands of Utes that passed through the area who were followed by the pioneering ranchers and miners arrived back in the 1800's. Looking to the west a keen eye can pick out portions of the Medaris and Pub View trails that are also popular hiking and mountain biking venues in the New Castle area. According to an article that we found online Prendergast Hill was named in honor of "Gladys Prendergast" who "served the Town as Clerk and Treasurer for 24 years...". As far as the trail goes it is a real nice something to do in the New Castle area that is right in town and easy to get to. Families with small children should be able to enjoy it as well as hikers, trail runners and mountain bikers. If you would like to see it for yourself then all you have to do is 'Take a hike'.